Microsoft will roll out IE7 to you whether you want it or not on February 12th unless you follow these directions. However, those directions to seem to apply to someone like me that's just running XP Pro on a home PC. Maybe this IE7 Blocker Toolkit is the way to go? I was able to successfully get this to work as follows. Extracted the files to a new folder named c:\IE7BlockerToolkit. Note that the format for the command is "IE70Blocker.cmd [computer name] /B"
If you're not sure what your computer name is, at the DOS prompt, you can type "net view". Mine says \\DELL2400MHZ. So, my computer name is DELL2400MHZ. You can also get this by Right-Clicking on the "My Computer" icon on your desktop and then selecting the Computer Name tab. Your computer name is listed by "Full Computer Name". So, I've got this handy little IE7 Blocker Toolkit installed. Will it work on or after February 12th? Microsoft has not said specifically whether the IE7 Blocker Toolkit will continue to function on February 12th and beyond. This guy makes art out of those little stickers on fruit. Hilarious. Here's a post that I submitted on the Professional Pilots Rumor Network today. My suggestion is that the mysterious crash of Flight BA037 would be solved more quickly if all of the data was released to the public. Apparently, although it's intuitively clear to me. this is a revolutionary concept to some people. I'm surprised that no one has called for the AAIB to post the data from the FDR/CVR/QAR in a public forum. They should, and for a variety of reasons. First of all, it's public information. Secondly, it's in the public's best interest that it be published, and the sooner it's made available, the safer the public will be. Some people say "stop trying to figure out what happened and just wait for the AAIB to tell us". That's fine if that's what they want to do. But, IMHO, it's not the quickest way to solve what happened on BA038. The quickest way to figure out what happened on BA038 is to make all data publicly available as soon as possible. Then, everyone on the planet can look at the data and try to figure out what caused the accident. They can do it around the clock from all over the globe. The problem is that, on this forum, we’re working at a disadvantage. We spend half of our time guessing at things we’d know if the data was made available to us. We weren’t allowed to hear the statements from the pilot and the copilot. We don’t know what messages they saw in the cockpit. We guess at their approach and their glideslope and whether they followed a CDA all the way in. We were guessing for days about whether the engines were running or whether they were shut down. Guessing at when the APU door opened. Whether the RAT was deployed. We guess at the OAT and the fuel temperature. All of that is on the FDR. Think how much further along we’d be at determining the cause of this crash if we had all the data. Think how much faster we could come to a reasonable conclusion about what caused the accident if we had all of the facts available to us that the AAIB is sitting on. Think how much further along the AAIB would be if we were helping them analyze the data. Think about that for a minute. I personally believe that the aircraft investigations could be speeded up immensely. Just think if every morning the AAIB guys read up on everything that was posted here in this forum while they drank their coffee. It’s not too far fetched. The news crews are doing it already. The magazines and the Daily Mail and the television shows are already reading our posts. We know that for a fact. And we were given precious little to go on. Only the stuff we could glean from disparate sources. A few photos. A cell phone video. This is a new world that we are living in. The AAIB is a government bureaucracy. They don’t need to go away, but they need to adapt to the changes that have occurred. They need to open up their data to take advantage of the ruthless efficiency of the internet. So that everyone all over the world can review the data, hypothesize, criticize, speculate, and ultimately help deduce what went wrong. 1. Only AAIB/NTSB investigators are qualified to determine what caused the crash. 2. The data is private, sensitive, or confidential. 3. Because there is potential liability involved on behalf of Boeing, Rolls-Royce, or British Airways the data can’t be made public. 4. The pilot’s have a right to privacy. 5. They would come to the wrong conclusion. 6. There’s no benefit from making the data public. Each of these potential assertions are refuted in the extended entry. Continue reading "Release the FDR/CVR/QAR data to the public"
Oh my God. If this doesn't make you vote against Hillary Clinton, then you shouldn't be allowed to vote. Seriously. This nutroots liberal is basically a communist. Listen to this drivel. In the words of one brainless interviewee on this video, "Here go the facts..."
So, think about this. This is nothing short of socialized healthcare. It's the failed HillaryCare welfare all over again. "No one would be allowed to be denied coverage because of a pre-existing condition" and they will "cap the monthly premiums at a percentage of your income". Then why on earth would you ever get insurance? You'd be a fool to pay for insurance. Just wait until you get diagnosed with cancer and then quit your job and walk into the Emergency Room and say "Fix Me". And, of course, these people are so stupid that they're all nodding their heads like it's a great idea. Well, yeah. Communism has always been an easy sell to the lower class, hasn't it? This makes me want to repeal the 19th amendment today. Fred Thompson announced today that he was stepping down from the race for president. Well, I finally got my ISBN number today for the book Killing Strangers. I applied for an ISBN at this website. The 13 digit ISBN number I was assigned is....(drum roll).... 978-0-615-18758-7. I generated my EAN-13 bar code symbol using this free online barcode generator. How much space should I leave on my back cover for my ISBN barcode? Placing an ISBN on your book cover. What Caused British Airways Flight 38 (BA038) to Crash? So now, everyone's rushing to try to figure out what happened. Although everyone that posts their hypothesis seems to apologize profusely for speculating, I believe this exercise is extremely beneficial. The more people that work the problem, the quicker the problem will be solved. I'm a firm believer in the wisdom of crowds. I personally think that all information related to the crash should be posted immediately on a website for the public to digest. This includes the data from the flight data recorders and the interviews with the pilots as well. If they have nothing to hide, then there is no reason not to release this data immediately. It can only speed up the analysis. If it was a fuel problem, they probably wouldn't have shut off at the same time. Ditto for a fuel contamination problem. Bird strikes in both engines also seem very remote. A dual flameout of both engines at the same time is almost impossible. I am personally leaning toward a software problem. The engines in a Boeing 777 are controlled by computers. A pilot's input on the controls is considered by the computer, but it isn't the final arbiter in every case. The computer considers all sorts of things in addition to the input from the pilot. In this case, the pilot moved to increase the thrust, but the auto-throttles failed to produce the desired thrust in the engines. It appears that both of the engines died less than a minute before the plane touched down. Hunt for fatal flaw of Flight 38. Here's the Official Initial Report. Here's the Official Initial Report Update 23 January 2008. Update 1: JetPhotos.net has some decent analysis of the crash. Update 2: Discussion thread at Airliners.net. Update 3: More from Professional Pilots Rumor Network(PPRuNe). Update 4: In the photo above, it looks like the Boeing 777's Ram Air Turbine(RAT) was not deployed. Update 5: In the photo above, the taxi lights are illuminated on the nose strut indicating at least one engine was at idle or greater. The landing light at the left wing root also seems to be illuminated. Update 6: According to most airline's SOPs and BA's specifically, they must be fully stabilised by 1000' on an instrument approach. Fully stabilised is defined as being in the landing configuration, on speed, with the engines spooled up. On BA 38, the configuration was done below 1000'. Update 7: The APU intake door was not open at the time of impact. Update 8: There are usually a series of failures that lead to serious accidents, not a single event and it's important to not overly rely on the obvious or last event. 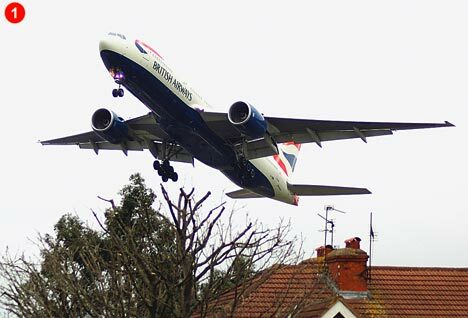 BA038 flew for 12 hours from Bejing to London, passing over Archangel, Russia. The temperatures at altitude were among the coldest they'd ever experienced, down to as low as -70 degrees Celsius on that day.The flight crew approached the 27L runway at Heathrow on a Continuous Descent Approach(CDA). In the CDA approach, widely practiced a tHeathrow(LHR), they descend on a 3 degree glideslope with engines basically at idle from altitude down until about 1,000 feet above the ground. They do this to save gas and reduce noise as they come in over London. Then, when they tried to throttle up, the engines failed to generate thrust because the signal to the FADEC(Full Authority Digital Engine Control) engines was corrupted. The Loss of Thrust Control(LOTC) wasn't noticed until the last minute because they were basically gliding down the glideslope on autopilot with the engines idling and by the time the pilots figured out they were experiencing a loss of thrust control(LOTC), they only had approximately 40 seconds before they hit the ground. They crash landed about 1,000 feet short of the runway. It looks as though both engines were running, albeit at low power, right up until impact. The engines were operating at or about flight idle, not generating enough power to sustain flight, but enough to provide electrical, hydraulic and pneumatic power to the aircraft. 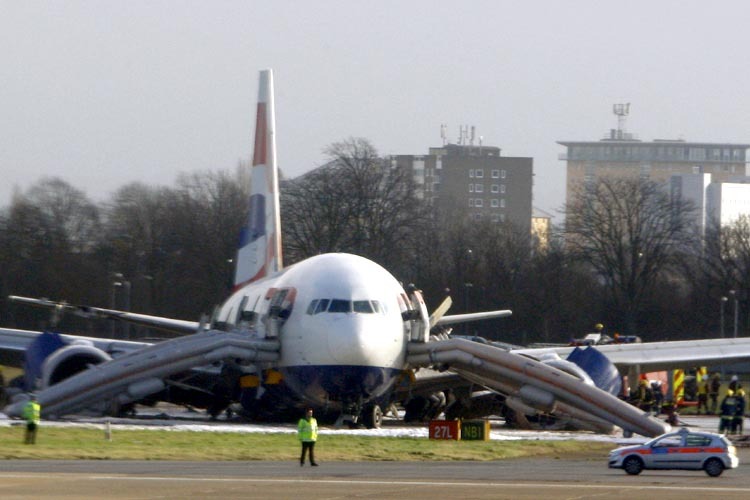 Update 9: Both engines of the British Airways jet that crash-landed at Heathrow Airport were still running when it came down, investigators have said. In its update, the AAIB said the Boeing's twin Rolls-Royce engines initially responded to the request for thrust, but after three seconds the thrust of the right engine reduced and after eight seconds there was a thrust reduction in the left one. Recorded data shows the aircraft had enough fuel and its automatic throttle and engine control systems had worked as expected, the AAIB said. The AAIB said it was now carrying out a "detailed analysis and examination of the complete fuel flow path from the aircraft tanks to the engine fuel nozzles". Source. Update 10: The temperatures were unusually cold for the flight of BA038 and there may have been problems caused by freezing fuel (fuel waxing). The Boeing 777 has two FCOC (Fuel cooled oil coolers) in the left wing and one in the right wing. The B777 has one FCOC (Fuel Cooled Oil Cooler) heat exchanger in the left wing tank and two heat exchangers in the right wing tank. Because the left wing tank only has one heat exchanger, its fuel can be slightly colder than the right wing tank. The right engine throttled back after about 3 seconds and the left engine throttled back 8 seconds later. See Boeing's Polar Route Operations Manual - Paragraph 3 - Cold Fuel Management. Update 11: Looks like it was ice in the fuel system that clogged the fuel lines. Secret Pilot Decoder Ring in the Extended Entry. Continue reading "What Caused British Airways Flight 38 (BA038) to Crash?" Jennifer has been complaining lately that there's not enough snow. I'm like...not enough snow? How much do you need? "I want you pull us around the yard on the sled with the four wheeler." "The four wheeler won't make it. The snow is too deep. It gets stuck." So, don't put on your tinfoil hats just yet. I'd say we're at about average snowfall for January. Not as much as last year, but last year I couldn't get in my own driveway for 3 months. "It's not hard to find free games on the Internet -- but it's damn near impossible to sift through the terabytes of crap to find good ones. That's where the editors of Games for Windows: The Official Magazine come in: We've tracked down another 101 absolutely, positively, no-strings-attached free games that are actually worth playing, grouped them into handy categories, and put most of 'em up on FileFront.com. There's something here for everyone, from RPGs to real-time strategy to Asteroids Flash games, though we have to confess up front: There are actually more than 101 free games here. So no complaining that you're not getting your money's worth." These kids were drunk and stoned, standing on top of the railing around the tiger's pen, yelling and waving at the tiger. Nice job. Darwin wins. If you haven't seen this video of Tom Cruise talking about Scientology, you need to check it out. He's as crazy as anyone I've ever seen or met. You will need a decoder ring to understand his gibberish. I found this Tom Cruise Secret Decoder Ring very helpful. • KSW: Short for Keeping Scientology Working, a policy written by Hubbard in the 1960s that requires all Scientologists to follow his words and his rules exactly. • Orgs: An abbreviation for "organizations"; describes all churches of Scientology throughout the world. • David Miscavige: He is the current leader of Scientology. He's the equivalent of the Pope to the Catholics. • Out-ethics: Any behavior that violates any of Hubbard's rules of conduct. • Put ethics in someone else: Make others conform to Hubbard's rules of behavior. • Criminon: Scientology front group that tries to recruit through the prisons. • SP: Suppressive Person. Anyone who doesn't like Scientology and/or criticizes Scientology. • PTS/SP: Another bogus Hubbard term to define behavior that goes against Scientology rules. • LRH technology or "tech": All of the Scientology policies, rules, mandates, and procedures. British Airways flight BA38 from Beijing to London crash landed short of the runway at Heathrow today. No fatalities. 17 reported injuries so far. 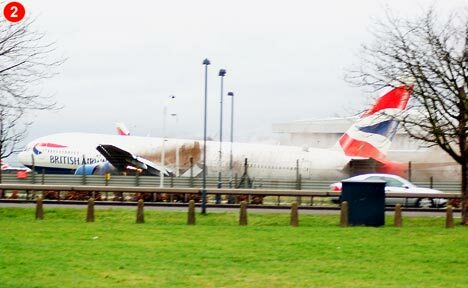 Too early to say what caused it, but rampant speculation at AirDisaster.com. 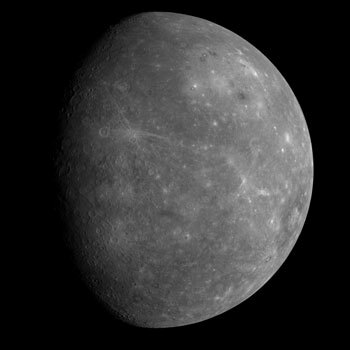 Yesterday, Messenger sent back the highest resolution photos of Mercury ever taken. Click on the image above for the high-resolution photo. Hillary Rodham said: “Dr. King’s dream began to be realized when President Johnson passed the Civil Rights Act,�? Mrs. Clinton said when asked about Mr. Obama’s rejoinder by Fox’s Major Garrett after her speech in Dover. “It took a president to get it done.�? Continue reading "Borsodi's Coffee House"
Here's an article on the oasis I stumbled across in Peru. I did not take the photo above, but I love the shot. It really gives you a sense the desert surrounding Huacachina. The Atacama/Sechura desert stretches for thousands of miles, from Peru down to the southern tip of Chile. 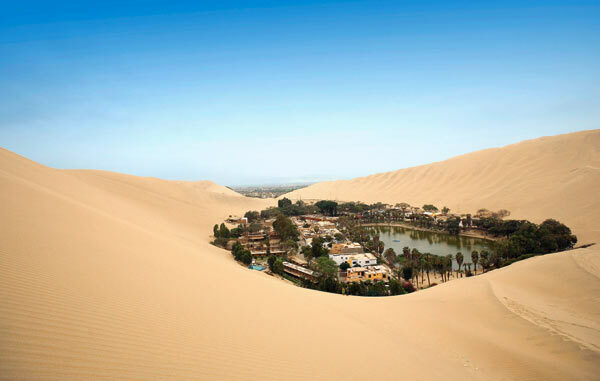 Around Huacachina, the dunes are hundreds of meters high. And then, there's this unimagined little oasis right in the middle of the desert where a natural freshwater spring flows up to create a lake with flowering trees and Bougainvillea. Ezra Levant’s opening statement before the Canadian “human rights commission,�? which has hauled him up on complaints by Muslims outraged that he republished the Danish Mohammed cartoons, courtesy of Michelle Malkin. No, I'm not making this up and no, it's not a joke. The state of California wants to control your thermostat. The proposed rules are contained in a document circulated by the California Energy Commission, which for more than three decades has set state energy efficiency standards for home appliances, like water heaters, air conditioners and refrigerators. The changes would allow utilities to adjust customers’ preset temperatures when the price of electricity is soaring. Customers could override the utilities’ suggested temperatures. But in emergencies, the utilities could override customers’ wishes. Final approval is expected next month. Those hypocrites at PETA got caught with their pants down once again. But as important as the iPhone has been to the fortunes of Apple and AT&T, its real impact is on the structure of the $11 billion-a-year US mobile phone industry. For decades, wireless carriers have treated manufacturers like serfs, using access to their networks as leverage to dictate what phones will get made, how much they will cost, and what features will be available on them. Handsets were viewed largely as cheap, disposable lures, massively subsidized to snare subscribers and lock them into using the carriers' proprietary services. But the iPhone upsets that balance of power. Carriers are learning that the right phone — even a pricey one — can win customers and bring in revenue. Now, in the pursuit of an Apple-like contract, every manufacturer is racing to create a phone that consumers will love, instead of one that the carriers approve of. "The iPhone is already changing the way carriers and manufacturers behave," says Michael Olson, a securities analyst at Piper Jaffray. These guys went around at the Consumer Electronics Show(CES) in Vegas with a tricked out tv remote control called TV-B-Gone and turned of just about every television in the show. Pretty funny. Last night, I spent several hours digging through various fonts trying to come up with a more interesting font for the cover of my best-selling book Killing Strangers. This is what I came up with. You can see the previous font on the right side of the screen. I'm looking for some feedback on this. Please post any thoughts in the comments. Update: I have a new one now. The font above is a typewriter font. Thoughts? Continue reading "New Font on Front Cover"
2. To show off in a dangerous manner, mostly with a vehicle or engine powered item .. I'm trying to find a more suitable font for my book "Killing Strangers". Initially, I just put it in as a Time New Roman font, but it occurs to me now that it's nothing like what I want. I want something like an old typewriter font. So, I'm digging around on the web for something more suitable. I kind of like these destroyed typewriter fonts. There are more typewriter fonts here and here and here. Oh my God I hope this is true. I hope this monster Hillary will drop out of the race. Please dear God...anyone but HIllary. The Information age allows business corporations and states to deliver their message more efficiently than ever before. This means more products, more advertisements and less free public space. Yet, Information age also allows activist groups and their counter messages to be heard by millions. Following is a fresh collection of popular and particularly interesting strategies, case studies and resources demonstrating the two-edged sword face of new media - where counteradvertising, commerce jamming and propaganda remixes make a stand. Weather permitting, I'd like to drive up into south Park County tonight and try to take some photos of the night sky, with the goal of trying to capture a photo of a shooting star. I searched for information on the internet, and they all say that you need an SLR camera on a tripod with a remote shutter release, and to set the camera to use Manual Focus and set the focus to infinity. So, all of this is intuitively obvious to the casual observer. 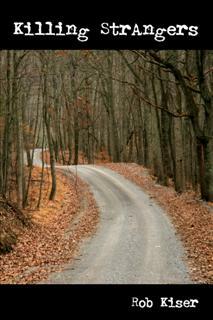 What is less obvious is the settings for the Aperture, Shutter Speed, and Film Speed. There are many things to consider. Initially, I figured I'd just use a very long bulb exposure. You can, in theory, keep the shutter open for a very long time - like say for 30 minutes or so. The thought being that the odds are if a shooting star passes during this time frame then you're bound to catch it. There are many problems with this however. OK. It looks like we've got another meteor shower scheduled. They say it's going to be the brightest meteor shower of 2008, but I have to admit I'm somewhat jaded. It seems like they always promise great showers and I only see one or five or ten or so. This time its the Quadrantids Meteor Shower on the night of January 3 - 4. Actually, the peak of this shower is on January 4 at 7 Universal Time – 1 a.m. Central Standard Time – during the night of January 3 for U.S. observers. In 2008, the moon is out of the way for this shower, which is known for being fast and furious. The shower has a sharp peak, and typically all worthwhile observing must be done no more than an hour or two either side of the peak. Face the general direction of northwest, beginning at about 11 p.m. Central Time on January 3. Remember that the meteors can be seen across a wide swath of sky. There's a little Java web application called FLUXTIMATOR that allows you to put in your location and it will show you the expected number of shooting stars per hour for a ten hour time frame. However, because the experts can't agree on exactly when the peak will occur, there are two different little FLUXTIMATOR applets. The first one is based on the assumption that the peak occurs at 2h00m UT. The second one is based on the assumption that the peak occurs at 6h40m UT . Mountain Standard Time (MST) is Coordinated Universal Time(UTC) - 7 hours. (UTC was formerly known as GMT). First, I put in "10 Quadrantis 02:00" - "Denver, US" - "Mountaintop" - "Jan 3-4, 2008" - "DST=No". In this case, the graph indicates that the "Peak Time:04:16" and the peak rate is about 28.8 meteorites per hour. Secondly, I put in "10 Quadrantis 06:40" - "Denver, US" - "Mountaintop" - "Jan 3-4, 2008" - "DST=No". In this case, the graph indicates that the "Peak Time:03:52" and the peak rate is about 52.7 meteorites per hour. This is a little confusing to me, however, as I would expect that if the we are "Assuming the peak is at 2h00m UT", then I would back 7 hours out of that and I would assume that the peak time in Denver would be 7:00 p.m. MST on Jan 3rd. Furthermore, in the second case, where we are "Assuming the peak is at 6h40m UT", I would assume that the peak would occur at 11:40 MST. I posted a question on SlashDot to see if someone smarter than me can explain it to me. Finally, the peak is supposed to be a sharp peak, so you may want to check at various times during the night. Good luck. Update: The applet is probably adjusting for the fact that it might be daylight at my location when the meteor shower is at peak intensity for the planet. So, even though the two predictions for peak activity are 4 hours and 40 minutes apart, the different peaks at my location are only 24 minutes apart. Santa brought Jennifer a rocket for Christmas and a couple of rocket engines. She is following a long and sordid tradition of model rocketry. We used them to put lizards and frogs into low earth orbit. Once, when we got a rocket stuck in a tree, Will and I tried to shoot it down with two rifles and a 12 gauge shotgun. When that didn't work, we cut the tree down with a chainsaw. Don't think we didn't do it. We did. Update: Jonathan points out that this rocket Will and I got stuck in a tree was, in fact, Jonathan's rocket. It was his Christmas present, apparently. Will and I took it and launched it and got it stuck in a tree, and then returned it to him, all shot it full of holes from the rifles and the 12 gauge16 gauge. I can't say that I recall that little detail - about the rocket belonging to Jonathan - but I'm certainly not in a position to deny it. Update 2: Will says it was a 16 gauge, not a 12 gauge. I'm inclined to believe that it was Jonathan's rocket, because we spent a lot of effort retrieving the rocket. So, it would stand to reason that it wasn't ours hence the importance of retrieving the rocket. Today, Jennifer assembled the rocket and we launched it in the neighbor's field because my place has too many trees. The rocket launches today were par for the course. I'd tell you how it turned out, but I'll let you watch the short video and see for yourself. This slideshow is composed of a few original images I shot today with the new Canon EOS 40D and the Canon EF 100-400mm f/1:4-5.6 IS USM lens. This slideshow (3:03) is an 18 Meg self-playing executable named rocket.exe created using Imagematics StillMotion PE. The soundtrack is Space Oddity by David Bowie, off of the Space Oddity album. 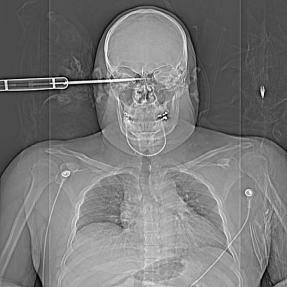 Continue reading "Ground Control to Major Tom"
I posted a link to Killing Strangers on Fark.com today. I've got my fingers crossed, hoping it gets a greenlight. This is pretty wild. I was at a party last night and Harry (one of my neighbors) was telling a story about a soldier his son had operated on that was wounded in Iraq. The soldier was blindsided with a knife to the side of his head while on patrol in Baghdad in October and came into the hospital with a knife handle sticking out of the side of his head. The blade went four inches into the side of his brain.